I was very fortunate to be able to attend an Essence Cosmetics this week. It was Valentine Day themed and so much fun. 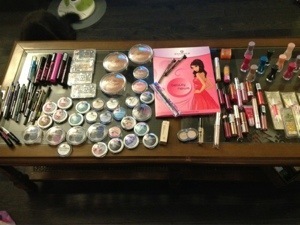 I got to get my nails done, my make up done and got quite the haul of product to take home and try. I haven’t gotten to test out much of what I got, but will keep posting my thoughts as I go through them. What I have tired out is the nail polish – and it’s pretty awesome. In the spirit of Valentine’s Day I did my toes pink and then put pink sparkles over top. I’m terrible at doing my own nail polish … thank god for remover. What I like about Essence’s polish is that it goes on great, thick and smooth. The brush is really professional so it doesn’t spread or drip the polish and get it all over my cuticles (Sally Hansen I’m referring to you and your crap nail polish). So, if you are looking to try a new polish I really suggest giving Essence a shot. Especially if you are a an impatient woman with a terribly unsteady hand!